Last week I needed a little break. After three very solid weeks of running my legs needed a little rest. The calf issues are solved. I have had some annoying foot issues. The good news is, I had this same issue back in January when I upped my run mileage. I know how to handle it. Rest! I did get three really solid bike rides in for the week. I backed off the mileage a bit and worked a little harder. I did some good steady climbing on Saturday's bike route. Yesterday's bike jaunt had some steeper climbing and I did them at the beginning and the end of the ride. I ran a 10K on Thursday. This training run included my fastest 2 mile time, my fastest 5K time and was also my fastest 10K - in training - to date. If I had not had to cool the engines down at mile 2.6 due to foot issues, this would have been my best mid-distance run ever. I swam for an hour twice last week too. I retrospect, I guess I didn't take TOO much down time. I just decreased the time spent and the mileage. So Carrie and I have been working diligently on the house remodel over the past four weeks. This past week we finished off painting the cabinets in my bathroom, painting the cabinets in the laundry room and patching and painting the walls in the laundry room. We have also replaced the lower cabinet on the newest section of the kitchen. Over the weekend I did some yard work, fertilized the trees and roses and worked on a plan to rebuild some shelving and storage in the workshop. There was a section of flooring that needed to be replaced with a slightly larger piece to prepare for the new carpeting we ordered on Wednesday. I also helped Carrie with some grout issues we had in the kitchen. This week I will focus on spin class in my mad dash to prepare for the 150+ mile Cochise County Cycling Classic that starts and finishes in Douglas, AZ. Yes it is a one-day event. I am shooting for 8 hr. 59 min. and 59 sec. With SOMA 70.3 8 days later I will also be prepping to that race. I will swim at least twice, have one more long outdoor bike day and slowly bring back the run to finish the week with a 13.1 at a manageable pace before the taper. Usually I loathe the taper. This time, I know that I need it. It will be welcome. Where have you been for a week? Rank 283 of 3,458 participants. 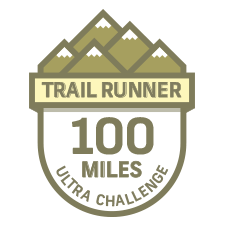 106 Total Miles of Trail Running in 16 days. This was tough. My previous high for ONE MONTH of running was 92 miles. I might be close to 200 miles for the month of September when it is all said and done. These weren't flat miles either. In total, the 15 runs I did to get to 106 miles had well over 9,000 feet of vertical climbing. I am also not going to lie. It made me tired. I will probably take a few days break from running. Saturday's ride was going very well. I was averaging below 130 for my heart rate and still averaging about 17 mph. I was also climbing for nearly the whole three hours before I hit some debris on the side of the road and RIPPED a gash in the sidewall of the rear tire about an inch long. I tried to McGyver the thing in several ways - but the gash was too large. So my 120 mile day was reduced to 60. I am okay with it because I felt great after the ride. I know I can sustain enough power and endurance to ride the 157 mile Cochise Challenge in under 9 hours. I just need to maintain my fitness for the next three weeks. Sunday's run was fun and it had a purpose. A friend and a runner - Karyn Yates - passed away on 09/14/12. Karyn died from complications brought on by a brain tumor. She was very close with my high school chum Mike Seiler. Carrie and I got the opportunity to hang out with Karyn two times. The first night Carrie and I met Karyn we each felt like we had known her for years. She was one of those people who made you feel like she had lived a thousand lives and rather than being pessimistic - she was sunny and light - while still keeping an air of real substance about her. She was a good influence. So I needed 14 miles to complete the Trail Running Challenge. At mile 6 or so ... while climbing a steep section of Trail 100 in Phoenix ... I stepped on one of those pointy rocks that are determined to leave my midfoot screaming for relief. I knew I'd messed it up for the day. I backed off the pace and just let things happen. It annoyed me for the next 12 miles or so. At mile 18 - it stopped hurting just long enough for me to finish the day with some pride. I thought - "So what ... you have a bruise on your foot. Just keep going." I did. I am glad. I will take a few days off to let it recover. I will also forever know that I did this 20 mile day for a reason and it was beyond my own selfishness. I spent a couple of weeks focused mostly on running. With the calf issues magically gone I could resume bike and swim training. Late last week I kicked it into the next gear. I had two good long swims on Thursday and Friday. It is so much nicer to be able to relax and still manage to cover some distance in the water. I am still not fast. We have made tons of progress on the house in the last two weeks. We took some time off between June and August because the work we did in March, April and May sort of burned us out. Plus, we were on the road a tone during this summer. Saturday was planned as my long ride. I wanted to get between 80 and 100 miles and needed to get some climbing. I left the house at 5:12am according to Senor Garmin. At mile 14 it was just after sun up and a bee found his way into my helmet. Rolling at about 21 mph, I could not stop and pull the helmet off fast enough. He stung me on the right side of my freshly-shaven dome. That slowed me down for a few moments as my head swelled up a little. I decided to ignore it and refocused on the task. I climbed over the ridge into Fountain Hills and down onto the IMAZ bike course. I rode down the Beeline to Gilbert Road - which is really the only part of the course that climbs. At the turn around I grabbed a gel and headed back up the route. The IMAZ bike course stops at Shea Blvd. I kept climbing. I rode out to Bush highway. Parts of this section of the Beeline climbs quite a bit. At mile 62 - I turned around and headed home. I had one more climb which was back over the ridge at Fountain Hills. I had sat back and conserved the whole day trying to simulate Ironman pace. Funny enough - this was probably my fastest and most comfortable 90 mile ride ever. Even with the climbing, stoplights, the bee incident, handing out a tube and a CO2 and stopping for water I averaged over 19 miles per hour. My average heart rate was down around 134 which is L1/Z1 for me. I believe this was my longest ride since IM St. George. This is good! I have built fitness without those long silly 6 hour ride days. We spent Saturday evening at Tom and Tui Conner's house for Tom's 60th birthday. "Tom Conner" is a guy that I believe is an international double agent. He's such an interesting man - he probably doesn't even drink Dos Equis. Truth be told - Tui runs the show. She gives Tom his mission requirements. Sunday morning I woke at 4:00am with the intention of getting the run out of the way. The problem was that I was not feeling very "worky outy". I went back to bed. I opted for the evening run. Mile 1 was rough. My quads were tired and I had very little torque. By mile 3 I was rolling again. It is funny how the body adapts once it understands your intentions. Then I got a break ... the clouds moved in and the last 6 miles of the run were much cooler and cloudy. I squeezed out 14 miles with about 1300 feet of hill climbing. I enjoy trail running. The paces are slower - but the terrain keeps me busy. In February 2011 I had an employee heath screening. I had already been training for over a month and had completed the Desert Classic Duathlon. I thought I was getting back into shape .... and I probably was ... but I was disappointed. It was the straw that broke the camel's back. I vowed a change. Over the past year and a half I have made so many changes in many ways. I believe that I have medical/scientific proof that some of the changes are working in my favor. Today - I had a health screening from the same company that administered the one back in 2011. I tell you what ... life moves by too fast nowadays. In September 2010 we were in Nashville wrapping up selling a house over there. We had also just finished the fan hike episode of the show Motion on the Live Well Network. That was the episode on the John Muir Trail in the Sierra National Forest of California. In September 2011 we were training up for the Bartlett Lake Olympic Triathlon. We had not yet done an Olympic distance race at this point last year. And here we are in September 2012. We have had a huge year and we continue to stay busy with remodeling the house, working, training and traveling. This was a good weekend. I found a balance of training with house chores. It makes life a little more pleasant that way. I ran and biked quite a bit. We walked. We talked. We painted three rooms in the house ... there is only one room left that has not received some level of painting - the laundry room. I've been trail running in an effort to get over the calf issues I've been having. I have been experimenting with shoes too. I have been running in Newtons. I like Newtons. I believe I have outgrown them or something in my gait has changed. I ditched the Newton Gravity in favor of a two-year-old pair of Nike Vomero 4's and my calf problems went away within two runs. This morning I was calf pain free for the whole 11 miles - and it was a trail run chocked full of climbing (1200 or so vertical). So ... back to the drawing board on the shoe choices. The shoe experiment has netted me my most productive seven day stretch of running ever. I ran 52 miles from 8/28/12 to 9/4/12. Granted - the trail running paces are a bit slower - but the terrain is MUCH more volatile - and when I get out on the flat on the street things seems easy. I went out for a 45 mile bike on Sunday evening. I flatted and there was a stout little headwind. I managed to keep my heart rate down to about a 135 bpm average. That is a feat for me. I usually just go out and hammer. I am trying to switch my mentality. I have also switched some things around food-wise. I am not going to talk too much about the change until I KNOW that is has netted some results. Suffice to say this is the biggest diet switch I have made since March of 2011. Hoping for cooler weather soon.